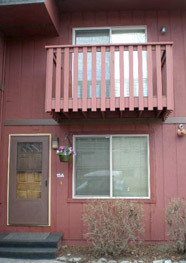 The Anchorage Oasis vacation rental offers travelers a convenient alternative to pricey, bland hotels in the city of Anchorage. Newly remodeled and fully equipped with bright, beautiful decor and furnishings, this midtown condo is perfect for both Alaskans spending time in the big city and travelers on their way to and from Seward and its environs. 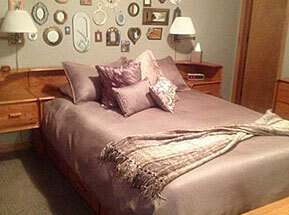 The Oasis is an Anchorage vacation rental property, not a bed and breakfast like our Seward lodgings. The second-floor master suite boasts a queen bed with a memory foam mattress topper and luxurious bedding, full bath, small viewing deck, cable TV and lots of closet and storage space. The living room offers a pull-out couch for extra sleeping space, additional seating, large-screen TV with cable, and an adjoining half-bath. 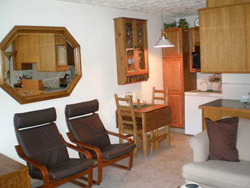 Adjacent is the kitchen, complete with dishes, pots and pans, and the dining area, furnished with table and chairs. The fully-stocked kitchen and the central location mean that both eating in and eating out are convenient options. The midtown location puts the condo only a short walk from several fast-food options, or a short drive from a fine-dining experience. The area offers easy access to public transportation, and is only a short drive or cab ride from Anchorage International Airport. Free Wifi is available at nearby Starbucks or McDonalds, both within easy walking distance. A keyless entry system allows guests to arrive anytime - specific check-in times are not required - and vacation rental use guidelines with all instructions are emailed 2 weeks before arrival date, along with a unique entry code. The condo offers the added amenities of a dishwasher, refrigerator/freezer, microwave, toaster, coffee and coffee pot, blender and cooking utensils. 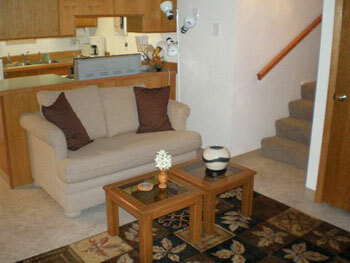 All linens are provided, and coin-operated washers and dryers are available in the basement common areas. No pets or smoking. From museums, movie theaters and fine dining, to fishing, wildlife viewing and mountain biking, Anchorage offers myriad activities and opportunities to suit any lifestyle. The condo sits near the municipality's green belt, with hiking, biking and ski trails that run for miles around the city. The Anchorage Oasis is currently not available for online bookings. Please contact us if you have any questions, or to make a reservation.